It’s a well-known fact that social media is widely used by consumers around the globe today. And you also know that most brands have taken to social media to improve their branding and drive more sales. But does social media really have an impact on people’s purchase decisions? In this article, we’ll explore this at length, and determine how to do social selling the right way. According to PricewaterhouseCoopers, 71% of global consumers are influenced by social media in some way. Even if you don’t see direct revenue, know that your social media presence still impacts people’s perspective about you. The PwC study found that 16% of consumers make purchases directly from social media. However, 45% of them read reviews and comments about brands on social media. Your social selling efforts can have both direct and indirect impact on your revenue. So if you enhance those efforts, you could also see improvements in your overall revenue. And this post is going to help you with exactly that. Before you start implementing any advanced social selling techniques, you need to get some of the basics right first. These are some of the most crucial steps you need to take to sell effectively using social media. If you’re reaching out to your audience using social media, it’s best to find out which channels they use. For example, there’s no point in running full-fledged Instagram campaigns if only a small fraction of your audience uses Instagram. So define your target audience first. And then find out which social media platforms they are most likely to use. The social media usage report by Pew Research Center can be of help here. Next, make sure your social media profile is easily visible to the relevant audience. You can do this by including relevant keywords in your description or bio. But that doesn’t mean you should stuff them with keywords. This impacts your SEO strategy directly. Your profile just needs to show up among the top results when people conduct a relevant search within the platform. For example, try searching for “natural beauty products” on Twitter. You’ll see that most of the top profiles in the search results have this phrase in their bio. Some are using it as it is while some are breaking it up and using the words in meaningful sentences. Another obvious and crucial step in social selling is to establish your value by providing your audience with valuable content. Instead of blatantly promoting your products and services, share relevant content that you think your audience will benefit from. Let’s say you’re an ice cream company. It’s only natural that you’ll want to use social media to share information about all the quality ingredients you use. And the ethical production process. At the same time, provide your followers with other information that they can apply in real life. For example, maybe a short video demonstrating how they can create unique dishes using one of your ice cream flavors. 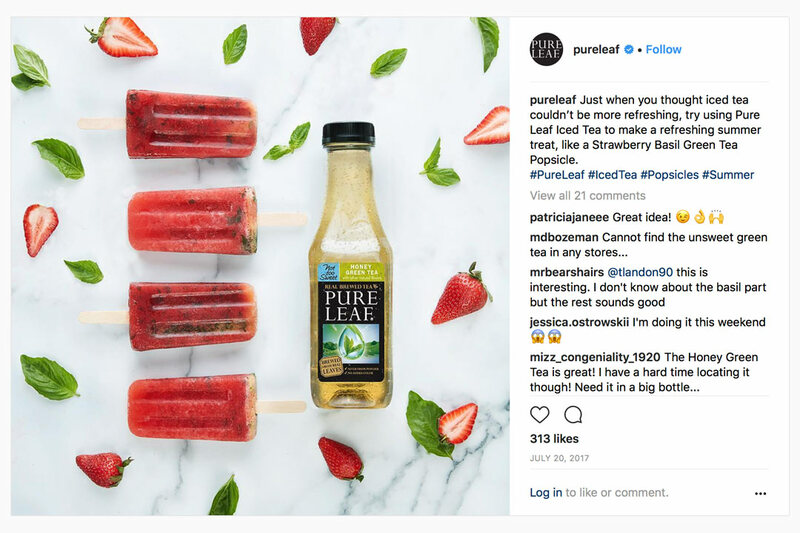 Pure Leaf gives their followers refreshing ideas on how to use their products. In the following post, they’re encouraging fans to use their iced tea to make popsicles. This can be very useful for consumers. 42% of consumers are prompted to buy from a brand if they provide educational content, according to a Sprout Social survey. Social media allows you to easily connect with your target audience and build lasting relationships with them. These relationships play a huge role in the effectiveness of your social selling efforts. Here are some excellent ways to build lasting relationships using social media. Your social media profile shouldn’t just have one-sided promotions from your end. You need to know your potential customers & actively engage with them by responding to their questions and comments. Not just on your own posts but also on posts in which they’ve tagged you. 48% of consumers are prompted to make a purchase when they see a brand being responsive on social media. And 83% of them have a positive sentiment about brands responding to questions on social media. 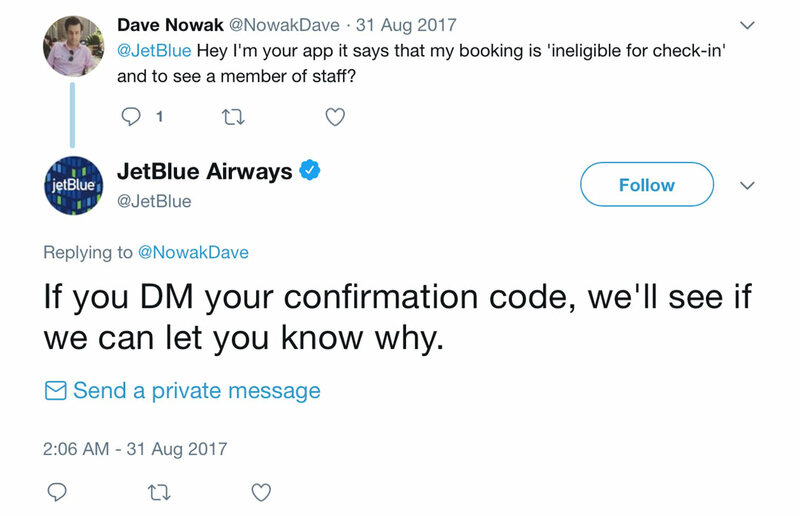 JetBlue sets the perfect example in engaging with their followers. They quickly respond to brand mentions and offer solutions to any issues customers may be experiencing. They thank passengers for sharing their positive experiences and sometimes retweet photos posted by their passengers. Influencer marketing is one such strategy using which you can successfully promote your products on social media. According to a study by TapInfluence, it delivers 11X higher ROI than any other form of digital marketing. Influencer recommendations today have a direct impact on consumer buying decisions. So leverage social media influencers to spread positive word-of-mouth about your brand on social media. The most important thing to be kept in mind for such campaigns is to select the right influencer. Someone whose niche aligns with your brand and products. And someone who has a decent-sized genuinely engaged followers who love their content. Platforms like Grin can help you find the right influencers for your brand based on niche, engagement, and reach. They also help you track the performance of your campaign so you know which influencer’s content is most effective. 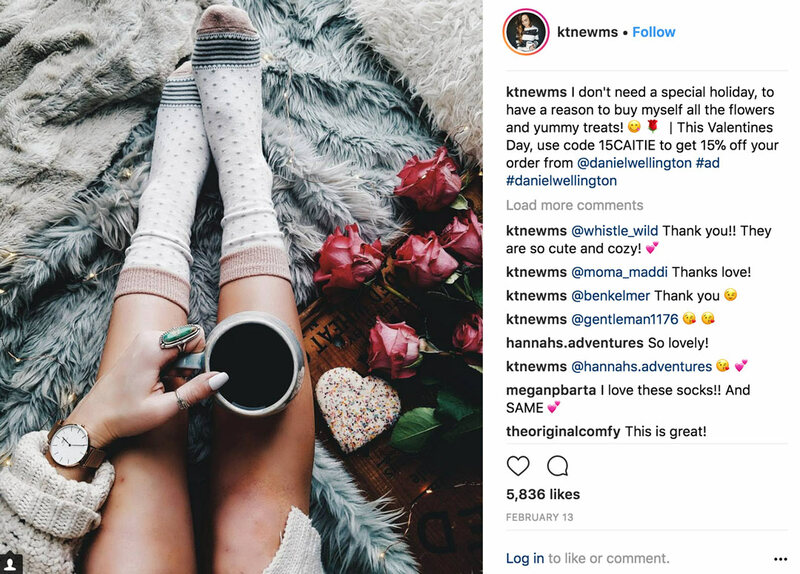 Watchmaker Daniel Wellington has nailed their social selling strategy with influencer marketing. They are regularly seen working with popular social influencers who endorse them on social media. Here’s an example of one such post. You can also grab the attention of new and relevant audiences by joining conversations relevant to your brand, or industry. You could provide relevant solutions and opinions whenever applicable to showcase your expertise. In the Sprout Social survey mentioned earlier, 68% of consumers have a positive sentiment about brands joining conversations. So this could prove to be a valuable tactic for winning over new customers. You can use tools like Mention to look for relevant conversations that you can join. You’ll be able to discover trending conversations about your brand or your competitors as well as about your industry. You can also sell effectively on social media by letting your customers do the talking. According to Olapic, consumers trust content from other consumers on social media seven times more than they trust advertising. And 56% of them are more likely to buy a product after seeing a positive or relatable customer-generated photo. So you need to encourage your customers to create content about your brand. This will help you win over more followers and your prospective customers. And the best way to do that is by turning them into advocates or representatives for your brand. It’s even better if they have a chance to earn something in exchange for their efforts. ReferralCandy can help you set up referral programs and provide incentives to your customers for spreading positive word-of-mouth. 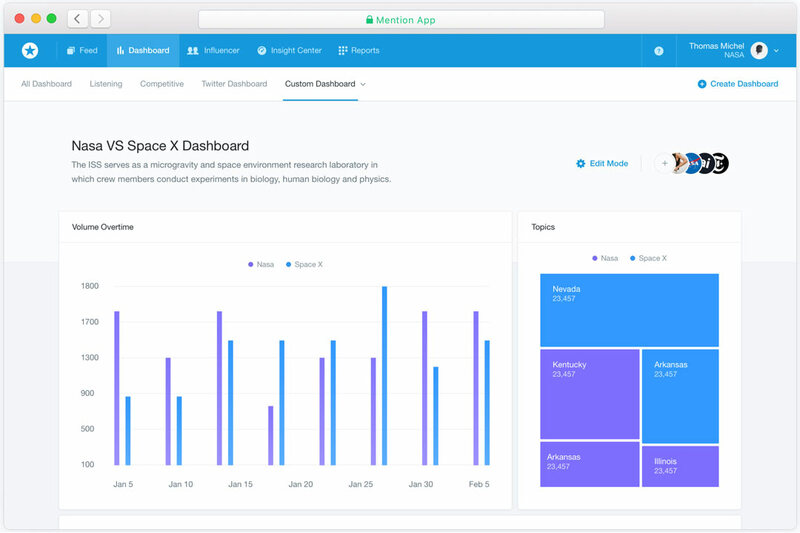 With its easy-to-use dashboards, you can manage referrals easily, track and improve your campaign. Finally, after executing your social selling campaign, make sure you keep an eye on the results. This will help you identify what’s working, and what isn’t. You’ll also be able to understand if your efforts need to be adjusted or leveraged to further enhance your performance. Got any questions about these tips? Feel free to submit them in the comment form below.